I'm using Unreal Engine 4 to develop plugins; plugins often make use of Unreal's Slate system, its UI framework to build custom editors. Slate makes use of a lot of square brackets. However, proepr highlighting for square brackets don't seem to be supported. Square brackets do get highlighted, but seemingly at random and multiple at once, no matter if they match or not. 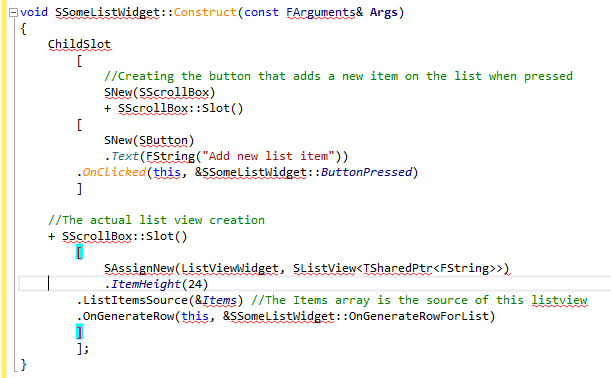 Having proper syntax highlighting for square brackets would be a much appreciated feature. Can you please post an example of how Slate uses square brackets? As you can see, everything is working correctly for me. Can you try this sample, from the URL, and see if you still get the problem highlighting? If so, can you please try changing the VA highlighting colour to something distinct, to check if the odd highlighting you are seeing is actually coming from VA, and not from another source? I changed the VA Brace Matching to a bright Cyan color like in your example, feline. The result is that sometimes the cyan color, and sometimes a darker, blue color gets used which is probably the default Visual Studio highlighting. When the caret is to the left of the bracket, the dark color gets used, if it's to the right, the VA color gets used. Additionally, if I put the caret on the left side (VS color), then put the caret to the left of another opening bracket, the previously VS colored bracket becomes VA colored, instead of being uncolored because it is no longer selected. So it looks like I had a false assumption and it seems to be working as intended, just that VS highlighting is interfering/working somewhat differently from VA highlighting. Is turning off VS highlighting encouraged? should fix this problem for you. If not, then something else is going on as well. Personally I prefer the VA highlighting method, since you don't have to place the caret onto one of the brackets to get the matching bracket highlighted, but this is a personal preference. Also, the current context highlighting instead of having to select the bracket itself really is a neat feature. Current context highlighting is why I personally much prefer VA's highlighting. Obviously if you do encounter a situation where the bracket highlighting is wrong please do tell us, preferably including a code sample, so I can try to figure out what is going wrong, and why.